MOAR rockets! 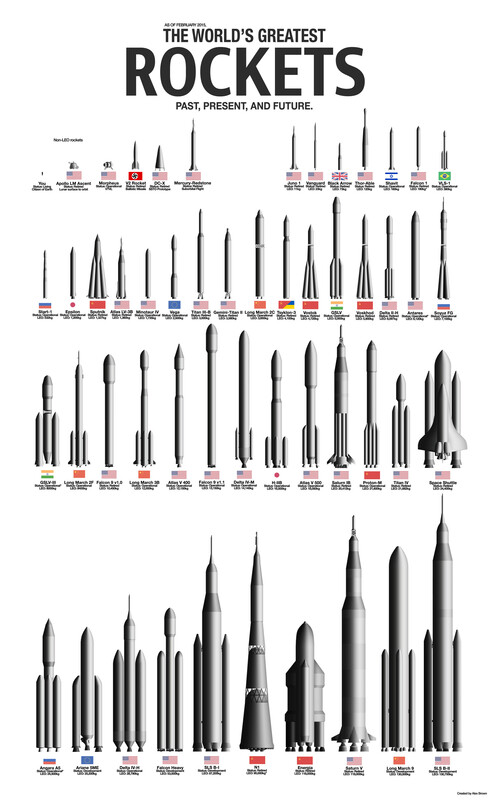 As a followup to our recent post about the Rockets of the World (to scale), here’s another graphic posted on imgur, created by Alex Brown. While the earlier graphic only included rockets that had flown, this one has rockets that are also in development, such as the SLS, Falcon Heavy and the Long March 9. It’s also a great look back at the history of rocket development, including the V-2 ballistic, England’s Black Arrow and Korolyov’v wide-body Sputnik. All are shown to scale, as compared with an average human being. As noted, this graphic is as of the present, February 2015. Alas, seemingly all of this derives from the work for war. Is there any possibility of posting a higher resolution? I can’t read what is written under each rocket. Oops, image was supposed to link to higher rez version…. now fixed and you should be able to view the original posted on imgur. For those who love to relativate weight to something they understand. 130 metric tons is about the maximum take-off weight of an A400M or C-130. Cool infographic! Nice to see SLS and Long March 9 (scheduled for the end of the 2020s!) there. Would be great also to see the new Chinese Long March 5 (comparable to Delta-IV Heavy, Ariane 5, etc) and 7 rockets added – they’ll be making maiden launches in 2016. What a travesty to include the V2 and completely ignore Robert Goddard’s rockets!